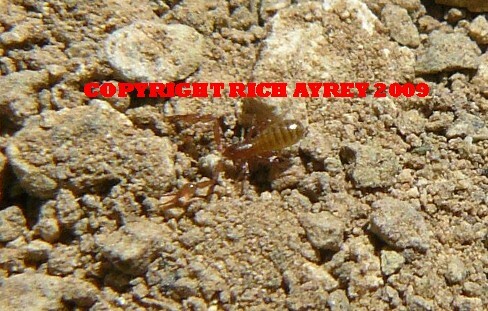 A 1/16 inch Pseudoscorpion from Western Arizona. This fantastic animal is about the size of one of the letters in this sentence. Arizona Scorpion World page created by Rich Ayrey of Flagstaff, AZ. Arizona Scorpion World Photographs by Rich Ayrey, unless otherwise marked. Do not reproduce without the written permission of the photographer. ©Copyright 1999-2009 Rich Ayrey Flagstaff, Arizona the Grand Canyon State. Arizona Scorpion page Created 04/20/09.